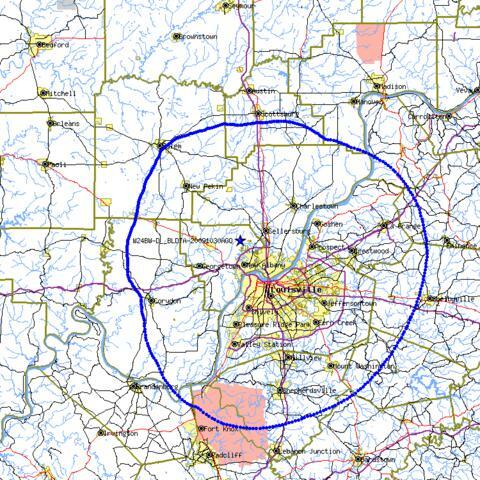 Here is the coverage area for the Kentuckiana Broadcast Group of stations. The WMYO-TV (LAFF Network) cable signal on 24.1 reaches 13 counties. WKYI-TV 24.2 can be seen in five cable counties in the Louisville Television DMA. Other stations in the Kentuckiana Broadcast Group of stations, including 24.1 & 24.2 can be watched over-the-air with a digital antenna in the Louisville Metro which includes Jefferson, Floyd, Clark, Scott, Oldham, and portions of surrounding counties including Bullitt, Trimble, Shelby, Spencer, Washington, and Harrison counties. The map below is the digital antenna map. Those watching with a house mounted digital antenna have picked us up as far away as Frankfort! On cable, the reach is wider! For more information contact the Kentuckiana Broadcast Group of stations. All Kentuckiana Broadcast Group of Stations can be viewed over-the air with a digital antenna in the Louisville Metro Television area. Some channels and programs may also be viewed on Spectrum Cable (Formerly TWC) and ATT U-Verse Cable in Kentucky and Southern Indiana. We are not carried on satellite. If you would like to watch us on DISH TV you may call toll-free: 1-800-823-4923. If you would like to see us on DIRECT TV you may call toll-free: 1-800-531-5000. Inform them you would like to see , WMYO-TV (24.1) , in the Louisville, Kentucky Television Market, included in its channel line-up.